Paul Coulombe took over the business from his father, and his daughter is now a co-owner. PORTLAND – One morning last year a marketing staffer at White Rock Distilleries’ Portland office handed CEO Paul Coulombe a shot glass of vodka. Try this, said the staffer. It’s a great new flavor. 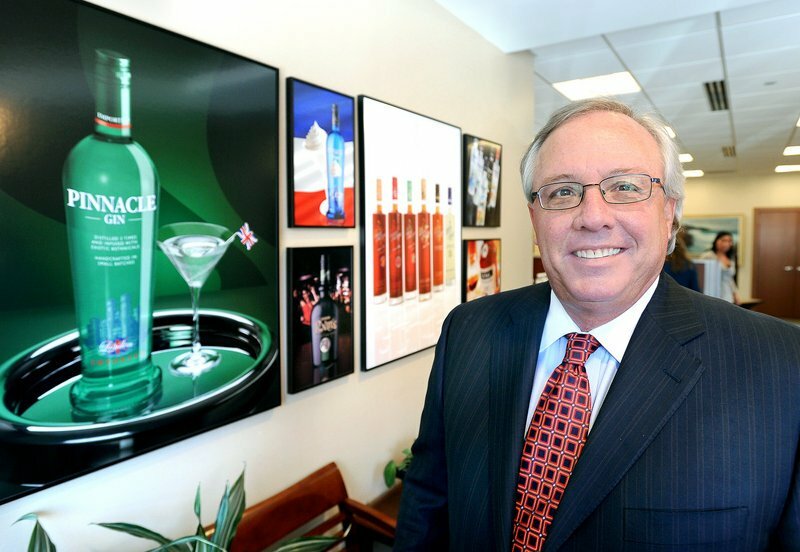 “We have enough flavors,” shot back Coulombe, whose Lewiston-based company sells some 100 brands of liquor, including Pinnacle Vodka. But the staffer insisted, so Coulombe took a sip, even before his morning coffee. “It tasted fabulous,” he said, remembering the moment. “Print labels tomorrow,” he told the staff. In May 2010, that product, a whipped cream-flavored vodka call Pinnacle Whipped, hit liquor store shelves. It was a quick hit and another success for Coulombe and White Rock. Last week, Coulombe, a tall and outgoing man with a broad chest, burst into his Portland office. He wore a black suit, a red tie and trailed a rolling suitcase. He was fresh off a jet from Florida. Coulombe lives in Maine, but he has a home near Naples, Fla., and a boat that takes him throughout the Bahamas. He was born in the Lewiston area to parents he described as modest. His father, Ray, worked at the Bates textile factory in Lewiston before the plant closed. In the 1960s, the family moved to Venezuela, where Coulombe’s father took another textile job. Coulombe attended an international school before the family moved home to Maine. In 1971, Coulombe’s father bought White Rock Distilleries, then a three-staffer company in Lewiston that distilled some 25,000 cases of liquor yearly, including Poland Spring vodka. Coulombe graduated from the University of Maine in 1975 with a degree in business management and went to work for his father, first as a salesman in Columbus, Ohio. He then moved to Hartford, Conn., before returning the Maine in the early 1980s. Coulombe became CEO of the company in 1995 and assumed complete ownership just a few years ago, when he purchased relatives’ company shares. Over time, White Rock changed from a liquor distiller into a bottling, branding and distribution company. The company buys liquor in bulk, flavors and bottles it at a 75,000-square-foot plant in Lewiston, and ships it to 50 states and 15 countries. White Rock owns some 100 liquor brands and earned $185 million in 2010, according to Coulombe. In essence, White Rock’s business is to create liquor brands. Coulombe’s first big success was Three Olives Vodka, sales of which took off about five years ago. He sold Three Olives in 2007 for an undisclosed sum, then focused on building the Pinnacle brand, which launched in 2003. Sales of Pinnacle boomed with the release last year of Pinnacle Whipped, which the company ships at a rate of 16,000 cases per week. Coulombe describes himself as a sales and marketing man, not an operations guy. Therefore, he stays clear of the Lewiston plant, which is overseen by CFO and COO John Suczynski, a former DeLorme top executive. White Rock’s president, 32-year staffer Bill Dabbelt, works from an office in Bonita Springs, Fla.
Coulombe, who is unmarried, owns a home on 6 acres on Pratts Island near Boothbay. He’s got a barn on the property where he keeps “any toy you’ve ever thought of,” including air hockey, pingpong and pool tables and pinball machines. Coulombe owns a 52-foot Morris Yacht sailboat and a 29-foot Hinckley powerboat. He keeps a 55-foot Sea Ray in Fort Lauderdale, Fla.
Coulombe, who owns shares in NetJets, travels by Citation Sovereign, a twin-engine private jet with a range of 2,847 miles and a cruise speed up to 526 mph. He often flies to South Florida and to the Bahamas, where he boards the Sea Ray for a few days of cruising. Coulombe particularly likes the Out Islands of the Bahamas, such as the Abacos and Exumas. This weekend, he was headed to Nassau. Coulombe owns one-third of White Rock; he said he gifted the remainder to his daughter, who lives in Boca Raton, Fla.
Coulombe’s mother lives in Lewiston. Though he sells liquor, Coulombe doesn’t drink much of the hard stuff.